Autumn is a critical time in the lawn care calendar. However, there’s lots you can do to prepare your lawn to make it through the difficult winter months and ensure it is looking its best come the spring. Sweep up fallen autumn leaves using a rake. This is really important as if left on the lawn, the leaves will rot down on top of the grass, causing damage and releasing pathogens, which could cause disease. Don’t let your leaves go to waste though, why not make your own leaf mould? As the weather starts to change, the grass will be growing much more slowly. Adjust the cutting height on your lawnmower so that it cuts the grass higher. Mow about once a fortnight until about mid-October, depending on weather conditions. Re-cut the lawn edges with a half-moon edging iron to create a neat finish. Trim the lawn edges every week using lawn-edging shears to give a neat finish. 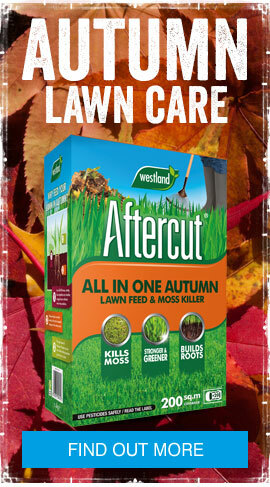 If the lawn is very mossy, treat with Aftercut Autumn All in One, which is specially formulated for the colder autumn months. Wait until the moss has turned black (about 2 weeks) and remove the dead moss using a rake. Don’t be tempted to use a summer feed on the lawn now. Instead treat the lawn to Aftercut Autumn All in One, which will provide enough feed for the autumn months. Bare patches can be tackled using Aftercut Patch Fix which is a unique patching mix containing grass seed, feed and seeding soil. It contains coated seeds which give improved germination and quicker seed establishment and features a pet urine neutraliser, making it perfect for pet owners. Now is the perfect time to consider laying stepping stones across the lawn, ready to protect vulnerable winter lawns from foot traffic. Well placed stepping stones allow easy access to areas of the garden such as the shed, compost bin or washing line without damaging the grass. Autumn is an excellent time of the year to sow a new lawn from seed. The soil is still warm from the summer and the autumn rain will provide vital moisture as the new lawn develops. It is vital to prepare the soil thoroughly and to keep the developing lawn properly watered. See our guide on how to sow a new lawn for step by step instructions. Gro-Sure Smart Seed is a great choice, as this guarantees success in full sun, shade, patches or worn areas. Read our how to repair patches in your lawn article for a step by step guide.